Hi there! So you are looking for a way to get the protection you need for your network, but you don’t want to hire a network engineer to configure your Cisco ASA Firewalls? Why Use a Dedicated Firewall? Firewalls are the first line of defense between your servers and every internet borne attack to your network. Our engineers are experienced with Cisco ASA firewalls that can protect your server and network equipment. Our engineers have years of experience behind them protecting both our customers and our infrastructure. By utilizing a dedicated firewall device, you can be sure that only what you want to allow visitors to see will be open. If you want to make a change, you can just open a ticket with our network engineers and we’ll make the changes for you. Many setups can be complex in design so Springs Hosting encourages customers to talk to us and our engineers for the best way to secure your business. Our managed firewall service is not limited to just colocated equipment, dedicated servers, or virtual private servers with us, but also to any business network including your branch office networks. Secure your network and information from unauthorized access, while maximizing network resiliency and maintaining business continuity. 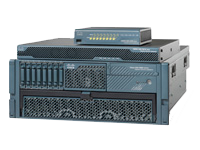 Cisco ASA 5500 series provide advanced application-aware firewall services with identity-based access control, denial of services (DoS) attack protection, and much more – all built upon market-proven Cisco PIX Security Appliance technology. The Cisco ASA 5500 series appliances include VPN technology to securely connect your remote users to your network and any remote or multi-site locations your business operates from. Extend your network with secure, flexible, seamless remote access. Our Engineers will custom build your security rules based on the applications you use. ASA10 – ASA5505-BUN-K9 up to 10 Up to 100M 10,000 $80 / mo. ASA50 – ASA5505-50-BUN-K9 Up to 50 Up to 100M 10,000 $90 / mo. ASAUL – ASA5505-UL-BUN-K9 Unlimited Up to 100M 10,000 $100 / mo. Conn. (Connections) are based on the max concurrent connections the Cisco device is capable of sustaining. Models above are based on the Cisco ASA 5505 variants. NOTE: There is a $100 one-time setup fee for managed firewalls.